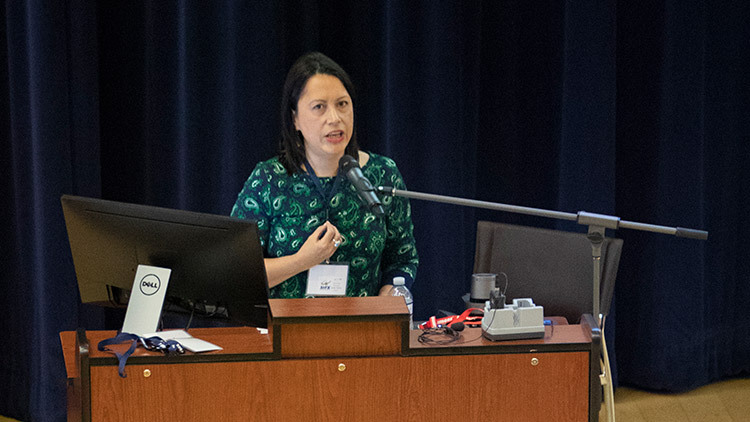 Dr. Margaret Kovach was the Scholar in Residence at the Third Annual Educational Research Forum held in StFX’s Schwartz Auditorium on July 23. Dr. Kovach (Sakewew p'sim iskwew) is of Plains Cree and Saulteaux ancestry and a member of Pasqua First Nation. She is a leading expert in Indigenous research methodologies in Canada and recognized around the world for her contributions to this field. Her keynote address was entitled What Makes Indigenous Methodologies Different? Principles, Practices, and Possibilities. Organizers say it provided important insights what constitutes Indigenous research. StFX education faculty Dr. Joanne Tompkins says Dr. Kovach noted nine guiding principles: purpose, ethical research, community engagement, Indigenous Knowledges, oral dissemination, personal story, holistic preparation, social justice through Indigenous research, reciprocity and finally the fact that Indigenous research and researchers matter. “Through her passionate presentation, she kept her audience engaged for almost a full hour,” Dr. Tompkins says. In the audience were 150 StFX Master of Education and Master of Adult Education students who are beginning their program and a new cohort of 12 PhD students beginning their doctoral work in education as part of the Nova Scotia Inter-University Doctoral Program. Other graduate students came in from a distance through live streaming. Of particular interest were 16 Mi’kmaw and numerous non-Mi’kmaw educators and scholars currently engaging in decolonizing research. Dr. Kovach was welcomed to Mi’gma’gi by Christine Sylliboy, educator, community leader and graduate student from We’koqma’q Mi’kmaw community. Darlene Prosper, community leader, counsellor and advocate for education from Paq’tnkek Mi’kmaw Community gave words of a gift of tobacco as thanks to Dr. Kovach and offered a gift of quill and beaded earrings produced by local craftsperson and artists Mary Catherine Lafford. Dr. Kovach spent the afternoon attending the Educational Research Forum listening to masters and doctoral students presenting their research to new graduate students. The following day Dr. Kovach spent time in graduate research classes held on campus. StFX Faculty of Education was fortunate to have such a talented, passionate and inspiring action-oriented Indigenous scholar on campus and thanks the Office of Research, the AVP, Dean of Education, and Continuing and Distance Education for partnering to bring Dr. Kovach to campus. One sobering note that Dr. Kovach left the audience with is was the statistic that in 2006 Indigenous scholars represented one per cent of all academics in Canada. Twelve years later, in 2018, Indigenous scholars represent only 1.4 per cent of all academics in Canada (CAUT, 2018). Clearly there is much more work to be done to Indigenize the academy, says Dr. Tompkins.